No surprise then, further along in the post I will talk about the daily accident portrayed in the featured image, but for now let me give you the flavour of an otherwise quite enjoyable day. Left at 9:30 after having had a little conversation with the hotel owner and all his family. They were obviously very impressed with the route and he wished me good luck. I have learned that Basque people are very gregarious and when, after my usual 12 “wake-up” miles, I had my breakfast in Aretxabaleta I got chatted up by four chaps sitting at the next table and, once we had completed the where-from-where-to conversation, they gave me some sound advice on the road to follow on the hills. I like this, people that help me in a foreign land. Let’s hope it lasts. 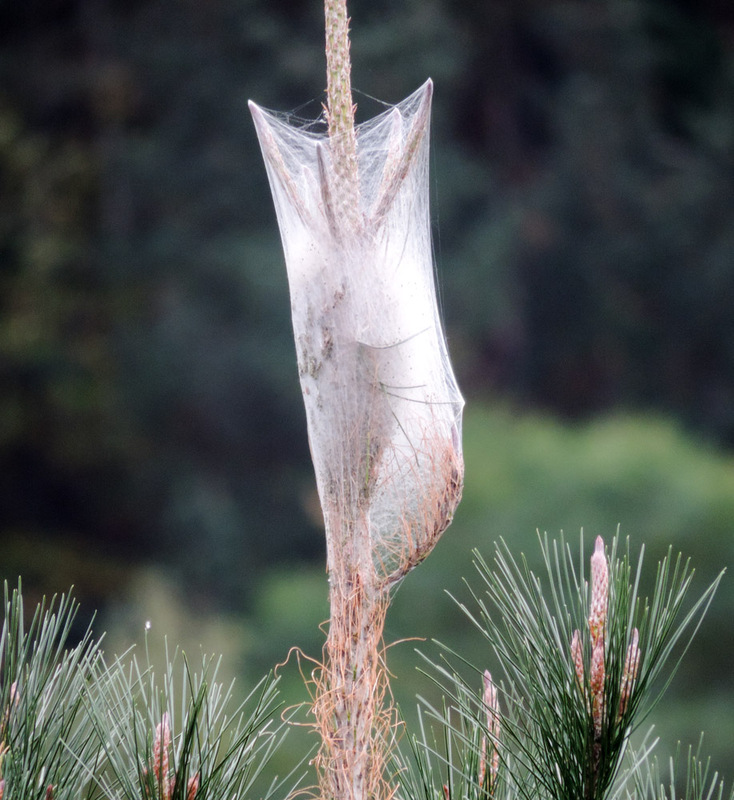 What are these funny webs on the trees? As part of the advice there was a rather life saving counsel. After the following town, Eskoriatza, there is a fork on the road and I was set to take the road to the right which followed the river rather than the one to the left that went into the hills. They discouraged me to do so and it was good they did. The two road merge after some six miles and a climb of almost one thousand feet. The road on the left, which I choose, distributed that climbs throughout the six miles. The road on the right was mostly flat with a one mile wall at the end, I know it as I had a bird’s eye view of it from the road I was on. As I was riding up I took the pictures of these strange web things, I saw a dead snake, which I did not photograph, and I did some GoPro filming which will feature on my Spain round up video. The general impression of the territory is however strange, it resembles incredibly the Appennini mountains south of Modena where I grew up, down to the abundance of chestnut trees. 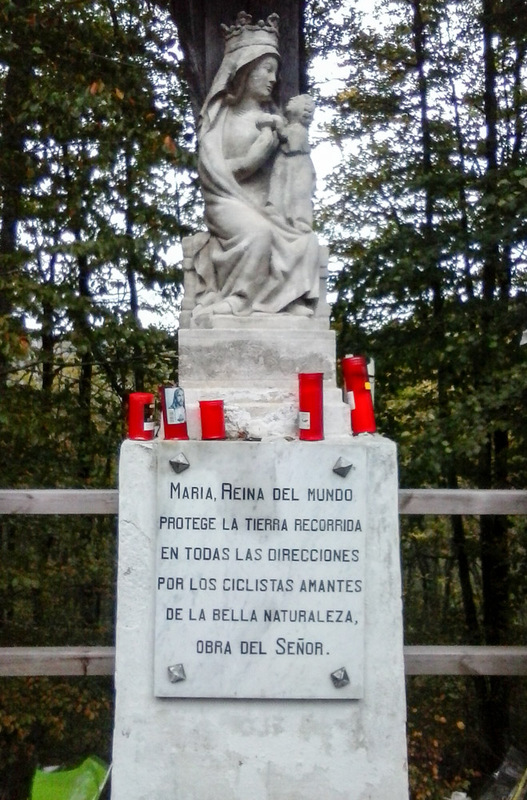 When I got to the top of the climb I was confronted with a rather adorned statue of the holy virgin. It must have been put there by a cycling club or something like that as the inscription was all about blessing for the cyclists. A very Spanish way to mark a summit. Obviously one popular with ciclistas. I was unsure about how to feel about it. 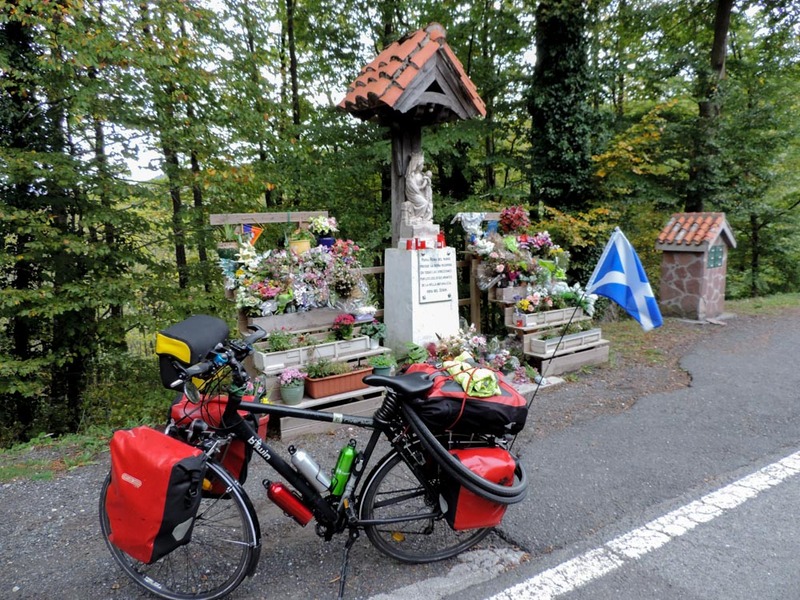 Where all those flowers and candles there to commemorate all the cyclists that had pegged it on these mountains? Coming to think about it there are an awful lot of flowers tied to trees and guard rails in Spain. Are the road really so dangerous? In doubt, I took a couple of picture, made my first FB appearance of the day and, as it has been pointed out to me already, made the awful mistake of not leaving an offering to the goddess of cycling. I did enjoy the descent. It is very satisfying to go downhill after you’ve gone up for a long time. You feel you’ve earned it, and you know there is not a steep climb to be served at the other end. In this case the descent went almost all the way to Victoria-Gasteiz. I missed the turn to the Ullíbarri-Gamboa reservoir which was a shame but in exchange I manage to get myself onto a cycle path that run into town and allowed me to avoid getting onto the dual carriageway road. Let me tell you that, if you ever decide to go for a cycling holiday in Spain, this is an issue. Sometime a perfectly nice road that looks just peachy for cycling goes and transforms itself onto a four lanes dual carriageway and there is no way to get out of it until the next exit. Anyways, I had been on this nice path for five minutes when I heard what sounded like a shotgun firing and it was followed by a sensation of rear instability of the bike. I was not making more than 10 MpH so it was no problem to stop and dismount to observe what had happened. 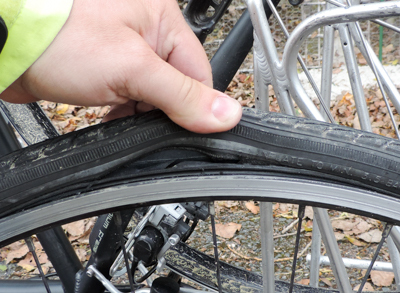 As I quickly suspected I had suffered a catastrophic failure of the rear tyre. 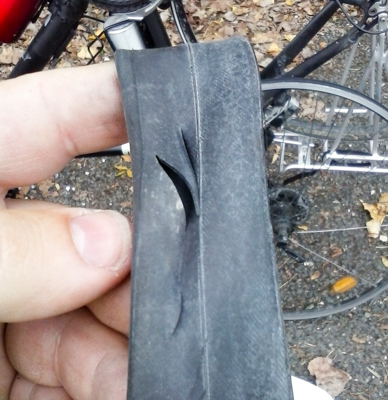 What I think happened was that the tyre itself broke and the pressure of the inner chamber pushed the tube out of the cut. Not contained by the tyre 5 BAR of pressure took no time to tell the inner tube that the volume needed for all that air was not the one afforded by the tyre chamber. All the same I think that 1,200 miles before one single failure is pretty good going. 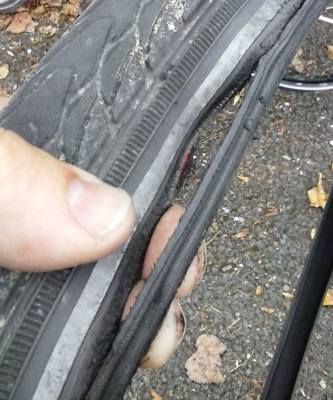 So this left me with not a puncture, that could have been repaired with a patch, but a failure that required not only a new inner tube but a new tyre too. Luckily I had both and the fixing, while not F1 level, did not take all that much. It also allowed me to evaluate the situation with my spares and made me discover that one of the spare tubes I had been carrying had been repaired twice before. NOTE TO SELF: by whole new ones before leaving Europe. So, was I surprised? No, these where the tyre the bike came with, remember the bike came from eBay. I am not sure how long they had been used before I got the bike, or how long they had sat doing nothing in the garage. I have been expecting something like this to happen and that’s why I had the two spares with me. Part of me is quite happy it has happened now rather than in Rabat or further along. 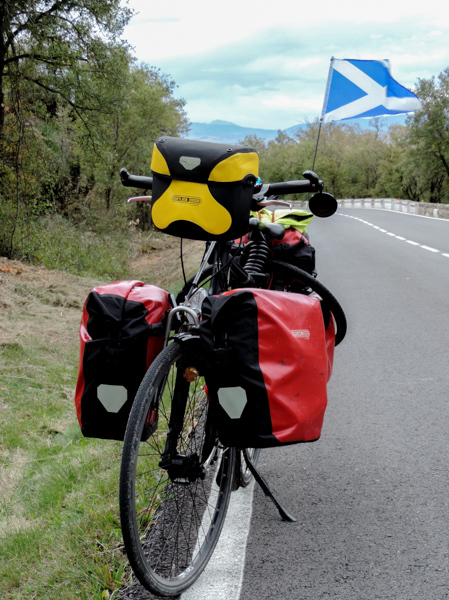 This way I can now get to the bottom of Spain, put the other tyre on the front wheel and buy two all new tyres to carry as spare for when I get in central Africa. Once I was operational again I picked up the pace as I was getting a bit concerned about time. It was something past one in the afternoon and I had only done twenty three miles out of the fifty I had planned today. If I continued this way there was little hope to get to Miranda de Ebro for the evening. Things did not get better after the meteoric lunch break I took just after Victoria-Gasteiz, more mountains loomed and, since in Spain there is no Google Cycle Routes, I had no idea if this was an up and down or just up and up. I choose to push on and I was rewarded by the most impressive descent I have had to date. The six miles from the top of the hills to the bottom brought my avrage speed for the day back from a puny 8 MpH to something near 10. After that I was sure I was going to make it so I took out the phone and sorted out accommodation. In less than an hour I was washed and settled and ready to write it all up. I have decided not to explore tonight, partly as I was rather underwhelmed by the town as I was passing through, partly as the “pension” I am staying at (€23.00) is on the wrong side of the tracks in all possible ways. Those mountains in the background, I was there earlier in the day. It’s great to see and read about your progress Alex, how are you equipped for changes in weather yet to come? The mountains you’ve been riding among look breath taking. Good to hear from you. If you’re thinking of hot weather in Africa, the answer is yes, I have shorts and T-shirts. At the moment I am chasing the last of the warm autumn to the bottom of Europe. 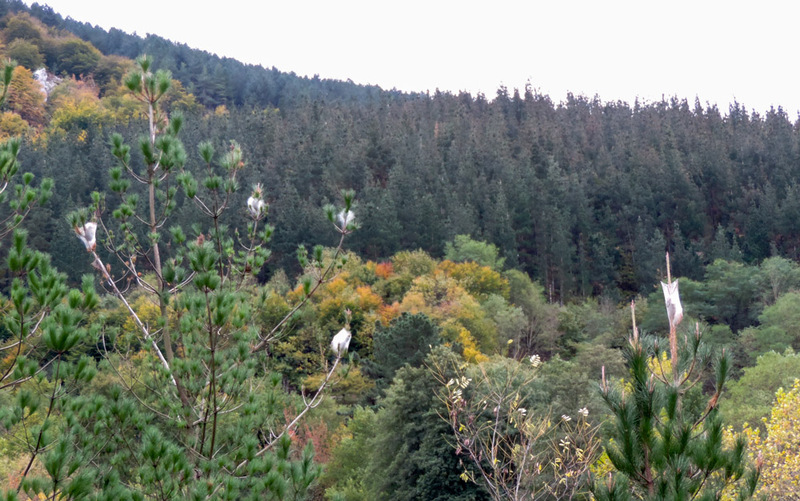 15º and dry today in northern Spain. So I’m not sure if you really want to know but those are the nests of the Pine processionary moth larvae or caterpillars. They come out at night and eat the needles. Don’t get too close as their hairs can cause very nasty rashes apparently. Anyway Alex, as you can tell I’m following your journey and tales with fascination and respect. To be honest I’ve always liked a story that comes with a map! I did really want to know, that’s very interesting. I kind of knew that if I’d throw it out there someone would have told me. Now off to another 50 miles to Burgos. sembra proprio colpa del copertone, può essere perchè vecchio o per troppo carico (devi diminuire di peso ) A Burgos incontrerai il sentiero di Compustela: Chissa che non ne percorri un tratto! Diminuire il peso non e’ facile, ho già abbandonato tutto quello che potevo ma tutto quello che mi è rimasto mi serve. L’unica cosa che potrei fare è prendere un rimorchio come questi.